I am finding Nick Veasy's artwork fascinating, odd, and beautiful, all at the same time. 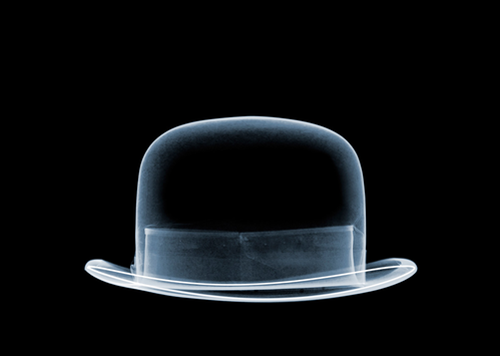 He is a British photographer who has been working with images primarily created by x-ray machines. His studio is in a decommissioned spy station in Kent (how James Bond of him!). 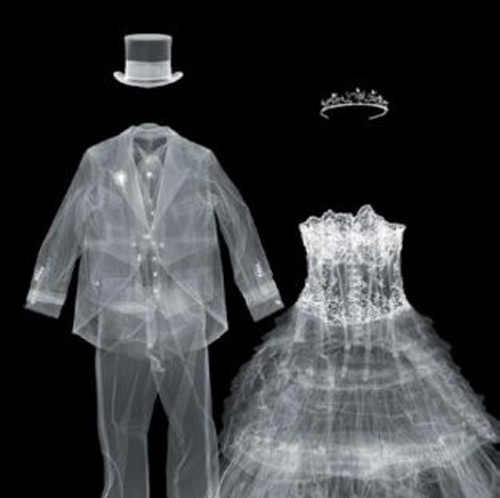 He has been x-raying a wide array of things- from animals and insects, to humans, to toys and electronics, and even large scale objects like school buses by using industrial x-ray machines. His latest series titled "Fashion" features articles of clothing and style (like these above). With this series he aims to contrast the beauty, style, excitement and comfort associated with the products created by the fashion industry with the "real" composition of these items which is actually plain, unexciting, and even unattractive if seen under a different lens. (i.e. do you see the small nails inside the Jimmy Choo shoes. I find these a little scary). I like the dialogue he has opened up and think that these pieces are visually stunning, giving meaning to "it is what is in the inside that counts" or "real beauty lies beneath". Very cool and interesting! I'm with you, those nails in the Jimmy Choo's are pretty scary!